Find out more about our workshops, retreats and	resources on our website. I added the details of the Owl Medicine workshop as described below. It seemed time in the midst of Winter to have a workshop with Owl. Some of the most powerful (and scary) experiences came from Owl as I was transforming many internal issues from ghosts that had haunted me to memories that explained who I am. After Buffalo Medicine in the Spring, I’ve not selected subjects yet. We will see how it goes. WHY is it that Crows torment the Owls as they sleep in the daytime? For the same reason that the Owls try to kill the Crows while they sleep at night. Listen to a tale of long ago and then you will see why. "Among men there is a king, and among the beasts, and the fish have one, too; but we birds have none. We ought to have a king. Let us choose one now." And so the birds talked the matter over and at last they all said, "Let us have the Owl for our king." No, not all, for one old Crow rose up and said, "For my part, I don't want the Owl to be our king. Look at him now while you are all crying that you want him for your king. See how sour he looks right now. If that's the cross look he wears when he is happy, how will he look when he is angry? I, for one, want no such sour-looking king!" Then the Crow flew up into the air crying, "I don't like it! I don't like it!" The Owl rose and followed him. From that time on the Crows and the Owls have been enemies. The birds chose a Turtle Dove to be their king, and then flew to their homes. See the Owl Medicine workshop. The four chambered heart consists of being fully centered (in our heart) and actively maintaining a strong, clear, open, and full heart. The strong heart means that we have true courage that is based on our internal authority of whom we are. We are able to show up and be present without preconceived notions, while having the Ability to Take Action and Enforce Boundaries. The clear heart means that we have removed our personal biases and blinders and developed a clarity about self so that we can see clearly whom we are by having respect for self and for others without confusing external temptations that can lead down the destructive path of envy or entitlement. With a clear heart, we are able to assess, analyze and contain, while saying what is so when it is so, without blame or judgment. The open heart is a heart that can love itself, having been nurtured by self, family, nature, and life. It does not measure against a bucket emptied by draining one’s source of life by not accepting the innate sense of being loved regardless of circumstances. With a open heart, we have the Ability to Connect and Feel, while paying attention to what has heart and meaning. The full heart means that we can embrace all of life with a sense of wisdom and generosity. It is an awareness that there are as many stories of what is life as there are people; hence, though we can influence others, we must always be open to them and their evolving story. With a full heart, we have the Ability to Initiate, Support and Create Order while being open to outcome. In the silence of who we are, we discover a part of our self that is sacred. This part of our self does not come to the surface through determination or brute force or sheer will power. Rather it emerges from within the sacredness of who we are when sacred space is opened and safely held. When we touch our own sacredness, we touch our soul. To find this part of our selves, we need to re-member who we are by traveling through the four chambers of our heart. What to expect: The workshop will do several shamanic journeys over the course of the weekend. The focus of the workshop is total immersion into the spiritual world for two days so that the emergence of one’s soul can surface through a memory, an insight, or a deep awareness. A large altar/vortex is created with four large rose quartz crystals and one large selenite. This creates a massive energetic field. Within this field, the people are able to find the safety necessary for the soul or inner parts of the self to come to the surface to heal and be healed. It is common for people to have transformational healing experiences. Who Should Come: All participants need to be experienced with the shamanic journey. What to Bring: Please bring any rocks or crystals that want to come along. A journal notebook with colored pencils or pens is encouraged as well as any comforts such as blankets, pillows, etc. The workshop is residential and will be held at a beautiful Lutheran kids camp at Dodgeville, WI. You will receive detailed instructions with your registration. We will begin class at 9 am on each day and end at 3 pm on Sunday afternoon. To Register: Please send a $100 deposit or the amount in full to Marie Smith 19126 Campbell Hill Dr, Richland Center, WI 53581. If you have questions, please contact Marie Smith at marie@hawkrdg.org or (608) 647-2366. The last day for registration is October 1, 2012. Cancellations received by October 1st will get a full refund. After October 1st there will be a $50 processing fee. The workshop is $525 if payment is postmarked by October 1, 2012, which includes lodging for Thursday, Friday and Saturday night, 3 meals on Friday, 3 meals on Saturday, and brunch on Sunday. There is a fee of $10 for linens and towels or you can provide your own. Class size is limited to 26. Presenter: Herb "One White Horse Standing" Stevenson (Shawnee and Cherokee) has been exploring indigenous healing practices for over 20 years. Rocks and crystals have been treasured for their beauty and healing energies since the dawn of time. In similar ways, rocks and crystals can assist in our spiritual journeys. For example, they bring forth spirit energies that provide interesting applications in the ordinary and non-ordinary realities. For some, the rock and crystal spirit energies can enhance shamanic work by adding new experiential dimensions to the ecstatic journey. For others, the rock and crystal spirit energies provide a new set of tools to be used in healing practices, such as establishing protective energy cocoons. At a minimum, as we learn to awaken the spirit energies of the rocks and crystals, parts of ourselves will begin to awaken as well. Using hands-on experiences, the workshop will focus on energy systems and creating a state of grace, balance and harmony, where healing of the body, mind, soul, and spirit can occur. We will use shamanic journeying to assist us in creating sacred spaces as healing processes for self and others. The workshop is designed for people from all walks of life. It is focused towards expanding the skills for spiritual explorers, practicing healers, and curious people. Hence, crystal healers, hands-on healers, shamanic practitioners, body-workers, and the delightfully inquisitive can expand their skills through the use of crystal energies. Please bring your drum(s), rattle(s), bell(s), and/or favorite noisemaker, as well as any rocks or crystals that want to come along. A journal notebook is encouraged as well as any comforts for sitting on the floor, such as blankets, pillows, etc. Dinner will be served on Friday night, Saturday- breakfast, lunch and dinner, Sunday breakfast and lunch—departure at 3pm. Registration will begin at 1:00 PM on Friday, November 30th at Camp Asbury. The workshop will begin Friday afternoon, Sat-all day and Sunday 9:00 a.m. to 3:00 p.m. The workshop will be held at Camp Asbury 10776 Asbury Rd Hiram Ohio 44234. The fee for the workshop is $395 if paid by October 1, 2012. If paid after October 1, 2012, the fee is $445. This includes room and six hot meals as listed above. For further information, kindly call Lauren at 216-272-8438 or e-mail lauren@therockgirls.com to reserve a space in the circle. Please send a check, payable to The Rock Girls inc. Mail the check to The Rock Girls Inc, PO Box 24455, Cleveland, OH 4412. Once paid-in-full you will receive info on your stay at Camp Asbury. Due to the workshop focus and the unique facilities, the attendance will be limited to 25 people. The Owl has an ancient aura of mystery. It is a symbol of the feminine, the moon, and the night. It has been believed to have great healing powers, ties to fertility and seduction, and is the bird of magic and darkness, of prophecy and wisdom. projection, and magic, both black and white. 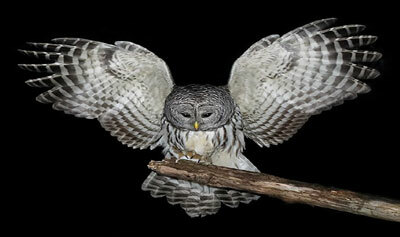 The Owl is the bird of the night, the symbol of darkness in which humans hide their secrets. It has great hearing and vision, especially at night. The yellow coloring of the eyes is symbolic of the light of the sun, alive in the night. The combination of keen hearing and eyesight enables one to see and hear what others try to hide. You will hear what is not being said and you will see what is hidden or in the shadows. You can detect and pinpoint the subtleties. This can make others uncomfortable because they will not be able of others' souls and life. This is very scary to most people. This vision and hearing capabilities has metaphysical links to the gifts of clairvoyance and clairaudience. The workshop will do several shamanic journeys over the course of the weekend. The focus of the workshop is total immersion into the spiritual world for two days so that the emergence of one’s soul can surface through a memory, an insight, or a deep awareness. A large altar/vortex is created with four large rose quartz crystals and one large selenite. This creates a massive energetic field. Within this field, the people are able to find the safety necessary for the soul or inner parts of the self to come to the surface to heal and be healed. It is common for people to have transformational healing experiences. All participants need to be experienced with the shamanic journey. Please bring any rocks or crystals that want to come along. A journal notebook with colored pencils or pens is encouraged as well as any comforts such as blankets, pillows, etc. The workshop is residential and will be held at a beautiful Lutheran kids camp at Dodgeville, WI. You will receive detailed instructions with your registration. We will begin class at 9 am on each day and end at 3pm on Sunday afternoon. To Register: Please send a $100 deposit or the amount in full to Marie Smith 19126 Campbell Hill Dr, Richland Center, WI 53581. If you have questions, please contact Marie Smith at marie@hawkrdg.org or (608) 647-2366 The last day for registration is December 31, 2012. Cancellations received by December 31st will get a full refund. After December 31st there will be a $50 processing fee. The workshop is $525 if payment is postmarked by December 31, 2012, which includes lodging for Thursday, Friday and Saturday night, 3 meals on Friday, 3 meals on Saturday, and brunch on Sunday. There is a fee of $10 for linens and towels or you can provide your own. There is financial assistance once the class reaches 16 people. It is based on financial need. There are no full scholarships. There is a couples discount of $100 for the second person. The American buffalo is actually a bison. The buffalo is a name that applies to the animals of Asia and Africa. To the plains Indians, it was a symbol of sacred life and abundance. Once a beautiful woman dressed in white buffalo fur appeared. She brought to the Lakota the sacred pipe which showed how all things were connected. She taught the men and women many mysteries of the earth, and she taught them how to pray and follow the proper path upon the earth. She showed them how to pray for and bring forth abundance. As she left, she rolled upon the earth and became a white buffalo calf and then disappeared over the horizon. No sooner has she disappeared and great herds of buffalo were seen all around the Indian camps. 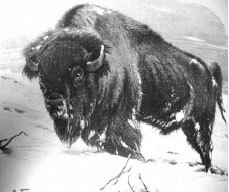 The bison is a large animal and can weight up to a ton and a half. It has a massive head, humped shoulders, and an almost exaggerated appearance because of its shaggy fur. Humps are often symbolic of stored forces—reservoirs that can be tapped. In the case of the bison, it reflects the abundance that is available if we know how to tap it. The fact that the hump occurs at the shoulder level, implies that we must incorporate our own efforts. Shoulders are symbolic of the ability to embrace and hold life. Upon shoulders are carried either our burdens or our rewards. The humped area on the shoulders implies the need for our own efforts. The Buffalo Medicine program is an initiation—a birthing process to more fully be who you are. The focus is to discover the innate healing presence within your self that have not been allowed to be seen or heard. We will nurture those parts so as to begin to create a more centered and balanced life. Our intent is to create the sacred space that will enable you to fully birth who you are, shedding the parts that no longer serve the fullness of your presence. Each person will be given the opportunity to be initiated into the Buffalo medicine. What to expect: The Buffalo Medicine workshop will do various journeys over the course of the weekend. Hence, participants need to be experienced with the shamanic journey. The focus of the workshop is total immersion into the spiritual world for three days. A large altar/vortex is created with large rocks and crystals. This creates a massive energetic field. Within this field, the people are able to find the safety necessary for the soul or inner parts of the self to come to the surface to heal and be healed. It is common for people to have transformational healing experiences. Who Should Come: The workshop is designed for people from all walks of life. It is focused towards expanding the skills for Shamanic practitioners, spiritual explorers, practicing healers, and curious people. What to Bring: Please bring any rocks or crystals that want to come along, as well as any Buffalo artifacts, claws, teeth, tools. A journal notebook is encouraged as well as any comforts for sitting on the floor, such as floor chairs, back supports, blankets, pillows, etc. Dinner will be served on Friday night, Saturday- breakfast, lunch and dinner, Sunday breakfast and lunch--- departure at 3pm. Registration will begin at 1:00 PM on Friday, March 15th at Camp Asbury. The workshop will begin Friday running int the night, Sat-all day and into the evening, and Sunday 9:00 a.m. to 3:00 p.m. The workshop will be held at Camp Asbury, 10776 Asbury Rd., Hiram Ohio 44234. The fee for the workshop is $395 if paid by February 1st, 2013. Send $100.00 deposit to hold your space or call Lauren if you need to discuss payment. If paid after February 1, 2013, the fee is $445. This includes room and six hot meals as listed above. For further information, kindly call Lauren at 216-272-8438 or e-mail lauren@therockgirls.com to reserve a space in the circle. Please send a check, payable to The Rock Girls inc. Mail the check to The Rock Girls Inc PO Box 24455, Cleveland Ohio 44124. Once paid-in-full you will receive info on your stay at Camp Asbury. Due to the workshop focus and the unique facilities, the attendance will be limited to 30 people. This is a shamanic newsletter and is intended only for educational and informational purposes. Any person needing therapeutic support should contact a mental health professional immediately.